The Library will be closed on 4/19/2019 for Good Friday, and will reopen on Saturday 4/20/2019 at 9am. The Mission of the Oxford Public Library is to inspire lifelong learning, advance knowledge, and strengthen our community. Valley Vigor – $500 Awarded randomly to any Oxford-based organization with 5 or more unique donors between 1 PM to 4 PM on April 23. Valley Vitality – $1,000 Awarded randomly to any Oxford-based organization with 5 or more unique donors between 7 AM to 10 AM on April 24. Read Out Loud – $500 Awarded randomly to one of any cradle to career or education-based organization with 5 or more unique donors between 4 PM to 7 PM on April 24. Thanks! The money raised will be used to improve your library services and programs! Support FOLIO with a donation-small $ or large $ welcome! How much money can you save by using our services and materials instead of purchasing yourself? You will be surprised-we are a great return on your tax investment! Visit our Library Value Calculator to see your total savings. Last year the CDC publicly announced that cases of Lyme disease are vastly underreported, and that 300,000 people are diagnosed each year in the U.S., which is 10 times as many as officially reported. Dr. Shawn M. Carney will discuss scientific findings about Lyme and other tick-borne illnesses as well as the most sensitive testing available. He will also discuss the role of integrative medicine as using effective anti-microbials, addressing other underlying conditions which make symptoms worse and removing barriers to wellness. Type 2 diabetes is becoming an epidemic in the United States. Dr. Shawn M. Carney will address how problems with blood sugar control develop. He will provide information on how to prevent type 2 diabetes, and what to do once diagnosed. Dr. Carney will also discuss specific dietary recommendations and supplements that can be very effective in helping control blood sugar levels and prevent debilitating complications. Dr. Shawn M. Carney is a naturopathic physician with a long history of helping patients of all ages with many different health concerns. After graduating with honors as a double major in environmental science and philosophy from Purchase College in New York, Dr. Carney continued to pursue a fusion of these interests by undertaking a career in integrative medicine. He received a doctorate in naturopathic medicine from the University of Bridgeport after having worked for several engineering and environmental science firms and serving as a full-time emergency medical technician. Dr. Carney has studied in a wide array of settings including physicians from the International Lyme and Associated Disease Society (ILADS).Register for programs online at tinyURL.com/OxfordCTLibrary or call us at 203-888-6944. 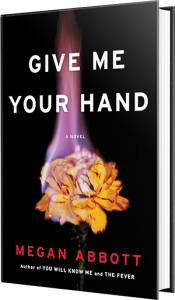 Please join us at 6:00pm on Thursday, April 25 for: “Give Me Your Hand” by Megan Abbot. A mesmerizing psychological thriller about how a secret can bind two friends together forever…or tear them apart. More than a decade later, Kit thinks she’s put Diane behind her forever and she’s begun to fulfill the scientific dreams Diane awakened in her. But the past comes roaring back when she discovers that Diane is her competition for a position both women covet, taking part in groundbreaking new research led by their idol. Soon enough, the two former friends find themselves locked in a dangerous game of cat-and-mouse that threatens to destroy them both. The FOLIO-sponsored Adult Book Discussion program series “Murder They Wrote” will continue on Saturday, May 11th at 2pm with Nonfiction title The Feathered Thief: Beauty, Obsession, and the Natural History Heist of the Century by Kirk Wallace Johnson. Coming in July: Nonfiction Title The Stranger Beside Me by Ann Rule. To sign up for Wowbrary, which is a service that sends you free weekly emails featuring Oxford Library’s most recent and wonderful new books, DVDs, and CDs we acquire each week, click here: Sign up for Wowbrary emails. Then enter the ZIP code, choose the circle next to Oxford Library, enter your email address twice, and click submit. Then you are all set to receive our weekly updates. Wowbrary allows you to immediately place reserves on all items you see of interest to you by clicking on the titles. BookCon is for the public – anyone who loves books. This weekend-long event on June 1st and 2nd 2019 combines family programs, author autographing, stage talks with literary heroes, the joy of meeting like-minded readers, and a huge celebration of the importance of reading. The Oxford Public Library is monitored by video surveillance cameras to deter criminal activity against the Library’s property, staff and building.